In this digital age, according to the National Association of Realtors® about 45 percent of buyers first start looking on the internet when searching for homes. We find that at least 80% will see a For Sale sign, then hop online to compare homes for sale, then contact the real estate agent. The real estate experts at Hire Realty LLC will market your Westchester County property for maximum exposure. Our website will provide buyers throughout the United States, or for that matter, throughout the world, the opportunity to view your home. 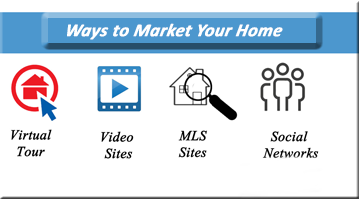 We will immediately add your property to the MLS where buyers will see your home listed with the details buyers want to see, complete with large images, interactive maps, community information, school information and more. Your home is immediately listed on the Multiple Listing Service (MLS), which updates a daily catalog of homes for sale through its member brokers and an on-line computer network, available to all of its members, with photos and descriptions of all listed properties. We personally submit a photo and the descriptive elements of your home to ensure that you have the best possible representation on the MLS. This means that all of the local agents will have your listing right away as a new listing, and can start showing it to their buyers. All of our property listings are online under Featured Listings on our website as well as on all local websites that subscribe to the Multiple Listing Service. Current research indicates that more than 80% of home buyers now begin the buying process online. Our website includes the most advanced tools available, including Interactive Maps and Automatic Email Notifications, to give buyers plenty of reasons to keep coming back. They will also be able to save your listing as a Favorite. Hire Realty LLC has FaceBook and Instagram and can market your home instantly to a larger audience. Our distinctive 'For Sale' sign will immediately be placed on your property along with a brochure box containing photo/property information flyers. Call Hire Realty LLC now to get started. Founder and broker Nick McMillan, having lived in Westchester County all of his life, knows the area well and can assist you in marketing your Westchester County property to its highest advantage. He will know the comparable properties and having assisted you with determining the best price, and how to show your home to highlight its best features and amenities, will market your home to attract the right buyers.